AUTEUR ARIEL: Can it be spring already? Can it be spring already? ...because my outfits lately have been ignoring the winter season. To be honest though, the weather lately has been pretty awesome. The sun is strong enough to warm your skin up during the day (eliminating the need for a heavy coat) but there is still that slight chill in the air that feels refreshing. I'd honestly be okay if spring decided to show up to the party a little early. What can I say, the Hawaii in me screams whenever a snowflake appears in my weather app. 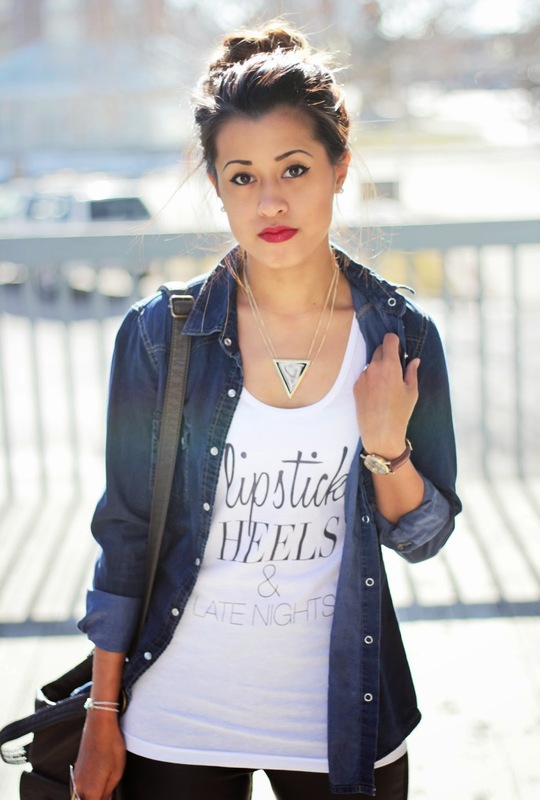 My favorites of this outfit is of course, the necklace and tank top from Style Lately. They are both so fun and casual--fitting into my wardrobe perfectly. Any piece of clothing that promotes "late nights" are invited into my closet because I don't remember the last time I fell asleep before midnight (I'm pretty sure I'm part owl). I also love how you can double up the necklace to wear it shorter (like I did in this outfit) or wear it normally. Versatile jewelry is the best. Oh hey, remember when I mentioned this past Monday how we were maybe going snowboarding? Well, we ended up going. I fell on my back. I fell on my face. I fist pumped when I made it down the hill a couple times without falling. We enjoyed this amazing view from the top of the mountain. ...until I woke up the next morning. I literally could not move my body, much less lift my hand to grab my phone on my nightstand. I should've seen it coming though. Boycotting the gym has its consequences. But thank goodness for amazing husbands who give you massages and load you up on Aleve, right? I'm doing better now, but I really do need to get back into shape. Love this! You look sooo adorable in it! Such a cute outfit! I'm SO ready for spring, too! Which is funny, because I'm totally a winter girl, but it's been feeling quite warm here in California lately in the afternoons, and it's like it's teasing me. 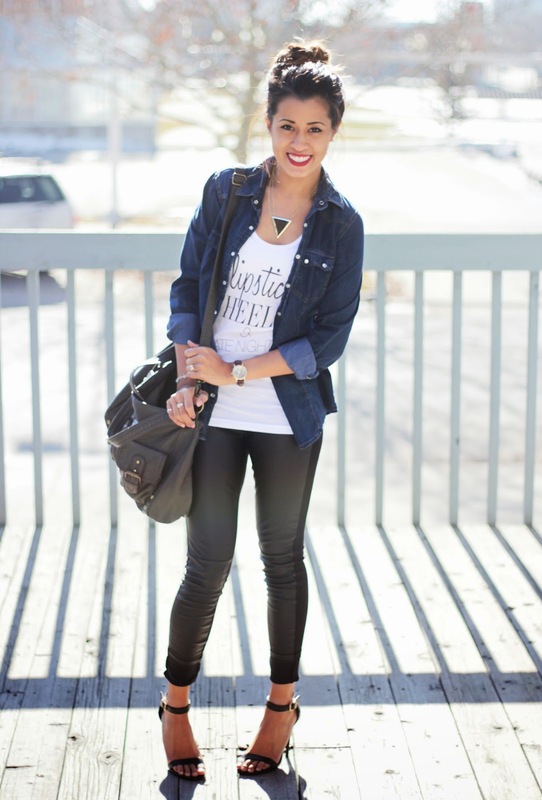 And oooh, I just loooove those leather paneled leggings. Plus your tee has such a fun message haha, I'm sure I'm half owl too! Looking gorgeous ! I wish it was warm here, I'm struggling with some -24 degree weather (celcius) ! 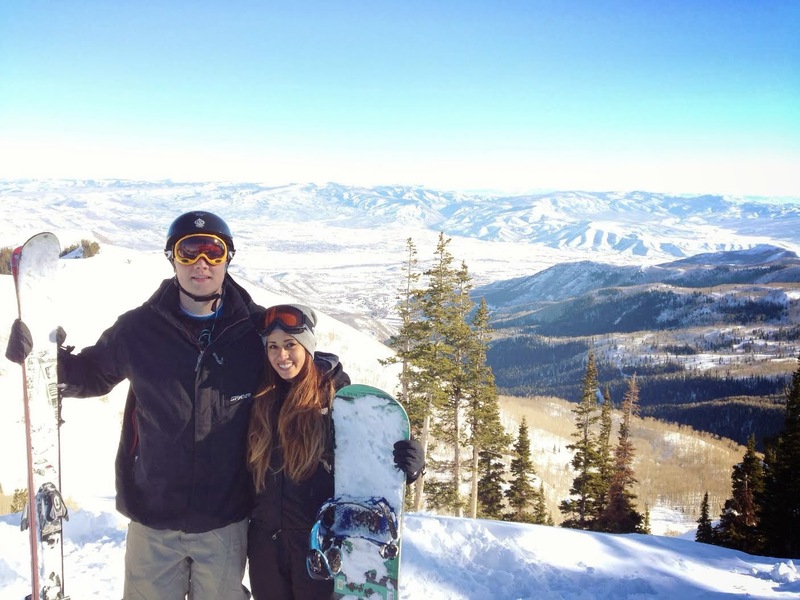 I had the exact same experience the first time I tried snowboarding - it was nuts! Believe me, though. It gets better every year! :] And I looooove your sunglasses, they're so cute! Oh! I love this whole look, especially your tee! Wow, I pinned this to my abcdefashion board! Amazing ensemble! Thank you for joining "Fashion item Friday". I really appreciate you being with us. Your style sense is so "spot - on". Adore those leggings!! So pretty! Pinning this to my Passion For Fashion board... thanks for linking up with us! Love this look! Those leggings look amazing with the heels! SO pretty! You look gorgeous! What a fun top! I've never gone snowboarding, but it sounds like so much fun! My husband has been promising to take me since we started dating...13 years ago! Love those leggings and your lip color is so pretty! Such a chic look! I love that adorable tee :) Thanks for sharing with Three-fer Thursday. LOVE this look! I'm so addicted to graphic tees and this one is adorable!! You styled it to perfection!